The Prosecco wine is produced with minimum 75% of Glera grapes and for the rest with local vine varieties (Verdiso, Bianchetta Trevigiana, Perera, Glera lunga, Chardonnay, Pinot Bianco, Pinot Grigio e Pinot Nero). The history of Prosecco dates back to 3 centuries ago, even if the Glera grapes were already grown during Roman empire in the city of Prosecco, located in Carso area (Friuli Venezia Giulia region). During 18th century, the cultivation of Glera was extended to all hills of Veneto and Friuli and also to the valleys of the regions. At the beginning of 1900, thanks to the development of sparkling techniques, the Prosecco as known today was born: straw-yellow colour, floral and fruity aroma, fresh and light taste. 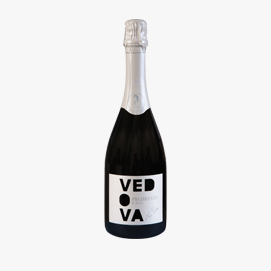 Cantine Vedova produces Prosecco wine under two different brands: Vedova and Casa Farive. Both brands mark different types of Conegliano Valdobbiadene Prosecco Superiore DOCG and of Prosecco DOC. The first fog announcing the arrival of autumn, the pleasure of finding the conviviality at the table again, the flavors of the “Rive” of a unique wine producing area. 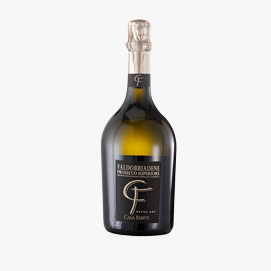 The perfect Prosecco Millesimato to be paired to light dishes and fish courses, with its fresh and soft taste, on a fruity, balanced finish. 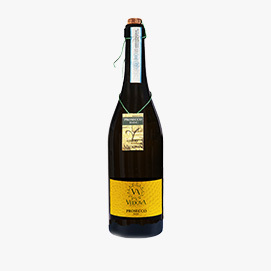 Spumante Extra Dry wine with a fine and persistent perlage, pleasantly fruity, with notes of ripe golden apple, combined with the delicate scent of white flowers. Its fresh and soft taste, on a savoury harmonious finish, make this wine ideal as an aperitif and paired to fish marinated with herbs. Produced in the Prosecco Superiore DOCG area. The Prosecco Superiore DOCG resulting from vineyards perched on the “Rive” of San Pietro of Barbozza, in the Prosecco Superiore DOCG area. 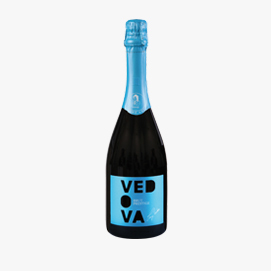 All the quality of a wine 100% Glera (Prosecco), of fine and persistent perlage, with a pleasant fruity bouquet with hints of ripe golden apple, peach and apricot. Perfect for appetizers, starters, and to enhance the flavour of shellfish. 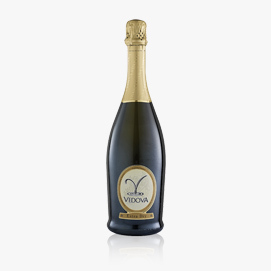 Spumante Superiore DOCG wine produced from 100% Glera (Prosecco) grapes, grown in the Municipality of Valdobbiadene. With its fruity and floral notes and its fresh, sweetish, soft taste, it is perfect for the most pleased toasts, and to enhance the taste of marinated rock fish or desserts. 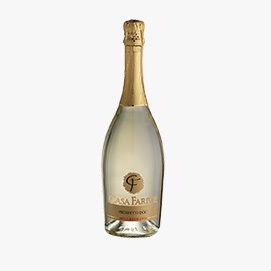 From the white grape-vineyards, belonging to the Viticultural area of Veneto region and ideal for the production of sparkling wine, a Brut White Cuveé with his dry and fresh taste, with a pleasant harmonious and persistent finish. From refined perlage and his delicate fruity aroma of sour apple, this wine suites to crustaceans and molluscs , and it is also excellent wine for every meal and for aperitifs. 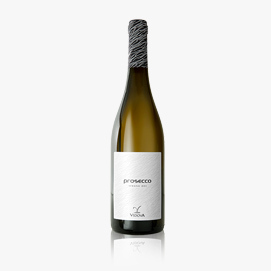 From grapes of Glera variety, belonging to the vineyards of Prosecco DOC area, a wine with a light straw yellow color with a rich and persistent perlage. Prosecco DOC Extra Dry gives you a pleasant fruity aroma, an elegant mix of golden apple and acacia flowers. The fresh taste with a harmonious finish makes the wine an excellent choice for an aperitif and a delicious combination with marinated fish with culinary herbs. Prosecco DOC Frizzante Legatura Spago: the perfect aperitif for a time of celebration, the wine to whet your appetite paired with savoury appetizers. The companion of your moments of conviviality, with its fresh, fruity and floral scent enhanced by hints of golden apple, with its dry, fresh and fruity taste and a pleasant floral aftertaste. Prosecco DOC Spumante Extra Dry from the hilly areas belonging to the Prosecco DOC area, a wine of fresh taste, fruity bouquet with hints of golden apple and acacia flowers. 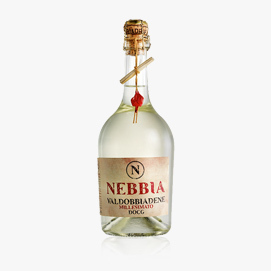 Strictly from the Glera grape variety, known as Prosecco, this wine is perfect with marinated with herbs fish, and is excellent as an aperitif. A Prosecco DOC wine with a fresh bouquet, with fruity and floral scents, “Tranquillo” in name and in fact. From Glera vineyards cultivated in the Prosecco DOC area, this wine can be paired perfectly with light courses, from fish-based aperitifs to white meats, to soft cheese.